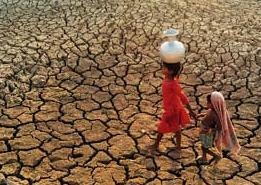 Even though the leading causes of to global warming originated in industrialized countries, the poorest regions, like those in Africa, will be the ones most affected due to their dependence on the presence natural resources that can be greatly affected by climate change. IN THE LAST FEW YEARS, since the Scientific Community accepted global warming as contrasting evidence, that has its origins in places of consumption, mainly in untenable industrialized countries. In April 2007, in Brussels, delegates of more than one hundred countries ratified the fourth report of the Intergovernmental Group by created by experts about Global Warming (abbreviated IPCC). The report describes the impacts, vulnerability and adaptations in distinct socioeconomic sectors, natural systems, and regions of the planet. “The Climate Change is felt on the daily activities of the African people and landscape with an unknown intensity” The report suggests that people in regions most dependent of raw natural resources will be the those most affected by climate change, implying that the change in climate will most dramatically affect people in the poorest parts of the world. In addition, an attempt to face the issue was made the summit of the United Nations in New York due to the threat of Global Warming. The discussed objective was a call for political initiative to reform the Keyoto Protocol with sights of reaching an agreement in 2009, so that it could be ratified before the actual agreement expires in 2012. The concerns about the effects and the actions to of climate consistently refer back to the industrial countries, precisely where the majority of the contaminants are produced. There is a habitual and possibly deliberate oversight by states, social collectives, and international organizations, and forms of communication about the causes Global Warming and negative effects. The Conference on Climate Change in Nairobi, held in November 2006, passed a decision called the Mechanism for Clean Development, in which developed countries called for projects that were more fairly distributed based on geographic distribution. Even so, in actuality, of the four hundred projects, only nine include Africa. The Climate Change is felt on the daily activities of the African people and landscape with an unknown intensity. The transformation of territories and the constant disappearance of traditional ways of life imply the irreparable loss of social and natural biodiversity. And if they realize the millions of people that depend on the fragile balance and ways of production in agriculture, farming and fishing, it is easily understood that in such a situation they are especially vulnerable. All of it will become inevitable including the movements of traditional populations, nomadic people, periodic droughts, shortages of resources or wars, all products of Global Warming. The unpredictable, changing and irreversible meteorological cycles that translate to a forced change to vital cycle, that derive for an undeterminable number of people looking for subsistence in cities. Large urban concentrations arise from a generalized form in the last years of the coast. One speaks of the increase of poverty on the coasts. Lacking the capacity to respond to the sanitary, alimentary and living demands and habitually on the edge of despair or a wall of contention that invites a massive escape to the first world countries. The concentrations of people who settle more frequently in bordering countries and go back and forth, like in the case of Mauritania, Morocco, Senegal, and Algeria. These do not have the capacity support the situation in the International Community that do not develop global, regional, and local strategies, that, for a part make it aware the necessity of a change in the forms and ways of consumption, and also to give and answer about the basic necessities of millions of human beings already condemned for many chronic factors, to those that are linked to the irreversible effects of Global Warming.